John Lydgate is arguably the most significant poet of fifteenth-century England, yet his position as Chaucer’s literary successor and his role as a Lancastrian poet have come to overshadow his contributions to English literature. Here, “fame” is identified as the key to Lydgate’s authorial self-fashioning in Chaucer’s wake. 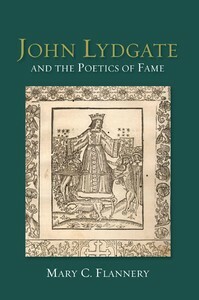 The author begins by situating Lydgatean fame within the literary, cultural and political landscape of late-medieval England, indicating how Lydgate diverges from Chaucer’s treatment of the subject by constructing a more confident model of authorship, according to which poets are the natural makers and recipients of fame. She then discusses the ways in which Lydgate draws on fourteenth-century poetry, the advisory tradition, and the laureate ideology borne out of trecento Italy; she shows that he deploys them to play upon reader anxieties in his short poems on dangerous speech, while depicting poets as the ultimate arbiters of fame in his longer poems and dramatic works. Throughout, the book challenges standard critical positions on questions relating to how poets fit into late-medieval society, how they can be powerful enough to admonish princes, and how English letters fare next to the literature of the continent and of antiquity. How did you become interested in the writings of John Lydgate? It all started with Shakespeare’s history plays. As an undergraduate, I was fascinated by the events dramatized in his ‘Henriad’ (Richard II, Henry IV 1 & 2, and Henry V), and that led me to my postgraduate work on the history and literature of England in the late fourteenth and early fifteenth centuries. It’s a fascinating period, both politically speaking and in terms of literary production. Richard II is dethroned in 1399, and the new Lancastrian regime immediately has to set about legitimizing itself in the eyes of observers in England and abroad. Within a year, a momentous event in English literary history occurs: Geoffrey Chaucer dies. Over the course of the following century, he is praised, imitated, and mourned by every ambitious poet in England. Lydgate is really at the centre of both of these movements: he’s extremely active as a Lancastrian poet, and is the foremost Chaucerian poet of the fifteenth century. These two roles make him a crucial actor in medieval England’s literary history. Your book argues that Lydgate, who wrote for many different patrons, was a poet who could ‘aid his patrons not only by responding to the political pressures of fame, but by generating good fame for his employers and, ultimately, for himself.’ Was he, in a sense, a kind of PR person for the stars of the 15th century? He certainly wrote on behalf of several of fifteenth-century England’s political stars—the Earl of Warwick, Humphrey duke of Gloucester, and even Henry V. And his verse performed a lot of the same functions that might be performed by modern-day PR: it celebrated his patrons’ achievements, grappled with the illegitimacy of the Lancastrian dynasty, and painted a picture of political continuity and progress. But the relationship between literature and power was conceived of rather differently in the Middle Ages from the way we conceive of it now. One of the points my book makes is that, in writing poetry of this nature, Lydgate is in fact consciously participating in a longstanding literary tradition that viewed poetry as a natural vehicle for fame. What we might be inclined to interpret as ‘mere’ publicity is, in Lydgate’s eyes, a supremely literary feat. You have a wide range of interests in medieval studies – you are also coming out with a book on The Culture of Inquisition in Medieval England, and a couple of years ago you co-created an exhibition at the Getty Museum on ‘Temptation and Salvation: The Psalms of King David’. What drives your interest in doing these various projects? My research has always been highly interdisciplinary—I’m convinced that the best way to learn about (and teach!) medieval literature is to situate it within its cultural contexts. Even though my interests in medieval studies range widely, my overall goal is to link medieval texts to the needs, fears, and desires that produced them. The Getty exhibition was a terrific opportunity to show the public how illustrated manuscripts of the Psalms not only recorded them as text, but also depicted key episodes from Biblical history and devotional life upon which readers might meditate. My forthcoming volume on inquisition (which I co-edit with Katie Walter) investigates how a change in legal procedure transformed textual production for several centuries. My hope is that my book on Lydgate will make clear that one cannot understand his authorial role unless one understands the multitude of roles played by fame in the literary, political, and legal history of medieval England. We thank Mary C. Flannery for answering our questions. Click here to visit her website.